Release Date: June 28th, 2006 by Warner Brothers Pictures. The Cast: Brandon Routh, Kate Bosworth, Kevin Spacey, James Marsden, Parker Posey, Frank Langella, Sam Huntington, Eva Marie Saint, Kal Penn, Noel Neill, Jack Larson, Marlon Brando. BASIC PREMISE: Superman (Routh) returns to Earth as Clark Kent to save the world from the evil plans of Lex Luther (Spacey) while trying to win back Lois Lane (Bosworth), the love of his life. ENTERTAINMENT VALUE: Superman Returns does have thrilling moments, but too many unnecessary scenes that drag the overall momentum. The first hour sets up the basic drama and conflicts which include Lex Luther’s diabolical plan to flood the east coast and to create his own island. Not that this plan sounds feasible to begin with, but that’s forgivable given that this is, in part, a fantastical action/adventure. On more realistic level, Superman must compete with Richard (Marsden), Lois Lane’s fiancée whom Lois turned to while he was away. Lois has an asthmatic young son who becomes important later on. Screenwriters Michael Dougherty and Dan Harris pack so much drama into the first half of the film that it’s easy to wonder when the action will finally come. Superman does have a few exciting scenes where he saves the day, mostly by picking heavy things up and blowing out fires, but more of those exciting, heroic scenes would have helped. There’s also an intentionally humorous side to the movie, especially during the banter between Lex Luther and his dumb, quirky assistant (Posey) who always carries a little cannibalistic dog with her. What about the special effects? The action does pick up occasionally with nifty special effects and it’s breathtaking to watch Superman hold onto Lois Lane as he, traditionally, flies her across the skies of Manhattan. Director Bryan Singer wisely chose Brandon Routh as his choice for Superman. Fortunately, Routh, a relatively unknown actor (until now), has an uncanny resemblance to Christopher Reeve in every scene, so you don’t feel as though you’re looking at an actor playing Superman. If only the same could be said for Kevin Spacey and Kate Bosworth, both of whom are talented actors, but they’re not convincing in these particular roles. 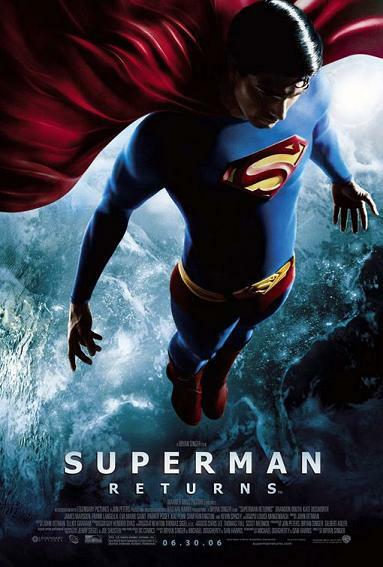 At a running time of 154 minutes, Superman Returns could have easily been edited down to 120 minutes by taking out some of the slow-paced dramatic scenes and focusing more on the fast-paced action. Nonetheless, it’s still somewhat exciting to watch Superman return to the big screen—including glorious IMAX screens this time around. INSULT TO YOUR INTELLIGENCE: None, as long as you suspend. NUMBER OF TIMES I CHECKED MY WATCH: 4 IN A NUTSHELL: Occasionally thrilling and exciting, but not enough action scenes and too much drama that tends to drag.